Trampolines can be expensive, so most buyers want to know they’re getting the best deal available. Trampolines aren’t a one-size-fits-all solution, so understanding the needs of your children and their level of athletic skill will help you narrow the list down to the perfect trampoline. Best Choice Products makes generic versions of popular products, especially athletic equipment. If you’re looking for the best trampoline for the money, you’ll love this alternative. This is bundled with a ladder and a safety net enclosure, making it safe and accessible for children of all ages. 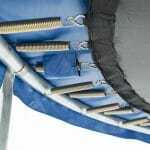 All of the coating, pipes, and springs are fade resistant, UV coated, and waterproofed to help them last just as long as the features on more expensive trampolines. 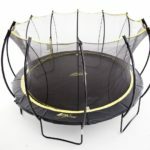 This trampoline is 12 feet in diameter, so the jumping surface is large enough for multiple children to bounce at once. All of the basic equipment is included, so you won’t need to purchase a ladder or enclosure separately. Competitively priced against similar higher end models. You’re getting virtually the same quality at an affordable price point by opting for the generic version. Not very customizable. You’ll need to use the equipment that was made to fit this trampoline, and it isn’t equipped with any accessories. The 12 foot diameter is the perfect size for multiple jumpers, but this trampoline may be too large for very small yards. It’s hard to beat the value of this package if you’re shopping on a budget. This trampoline comes with everything you need to get started. All you need to do is set it up and let your kids jump. This is the perfect one-and-done solution for families with school aged children. 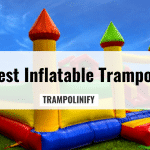 This trampoline comes in both a 15 foot and an 8 foot variety, but if you have toddlers or preschool aged children, the 8 foot variety is going to be your best bet. Little kids don’t need a huge jumping surface, and many parents actually prefer smaller diameter trampolines to keep their child safer. 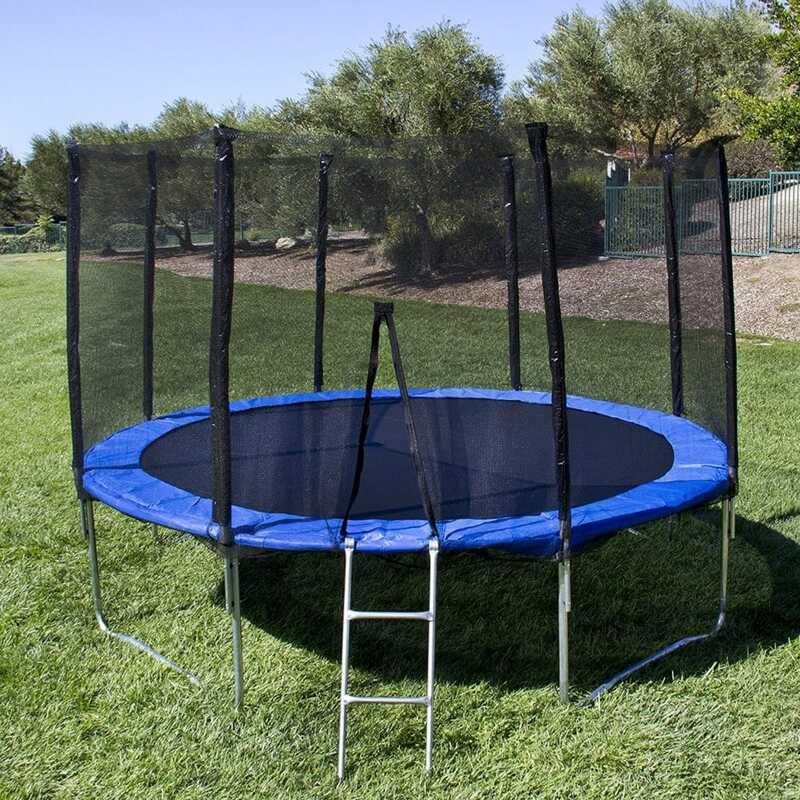 This comes with a safety enclosure to prevent little tumblers from falling on the ground, and the height is lower to keep the jumps at a safe maximum. Since it’s low to the ground, no ladder is needed. Tots can climb right in without any help. Right size and right price for small children. 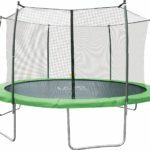 Children 5 and under don’t necessarily need a large trampoline, and the size provides maximum safety for little jumpers. Since the trampoline is low to the ground and completely surrounded by an enclosure net, you don’t have to worry about your adventurous youngsters pushing its limits. They can only jump so high. Compact 8 foot size is easy to fit in any back yard. Since this trampoline is meant for younger children, this means they’ll outgrow it. It won’t be as fun when they’re 12 years old – they’ll want a larger trampoline by then. This is the best cheap trampoline for families with very young children. It’s safe, dependable, and comes at a reasonable price. Since it’s compact, it’s easy to set up. 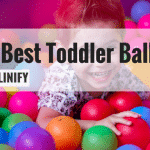 This is a great way for toddlers to get out all of that extra energy by being active. 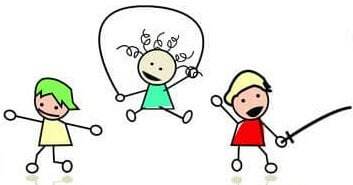 You’re promoting a healthier lifestyle among younger children and helping them form lifelong habits that associate exercise with fun. Skywalker is known for making excellent quality trampolines. Some of their models are exceedingly expensive, and this 10 foot trampoline bundle is their budget offering. If you want Skywalker quality for a reasonable price, it’s hard to pass up this deal. Skywalker uses a patented gapless enclosure system for maximum safety, and a reinforced construction for your peace of mind. It even comes in a variety of colors. 10 foot diameter offers an excellent compromise between price and size. 12 foot diameter trampolines are very expensive and occupy a lot of space. 10 foot trampolines are slightly less expensive, and they’re easier to place in your yard. Patented gapless enclosure offers you peace of mind. You’ll never have to worry about your children playing a little too rough and bypassing the safety net. 175 pound weight limit makes it safe for two or three children to jump together. Reinforced frame makes the trampoline safer, but also a little more difficult to set up. If you intend to take it down during the winter, it may be complicated to put it back up again. Skywalker is offering you the perfect way to get a name brand trampoline without spending a fortune. If you want to stick with a tried and true brand with an outstanding reputation, opting for their budget package is an excellent choice. Everyone loves a quality product for a great deal. Great indoor/outdoor trampolines can be hard to come by, but they’re a must for some families. Not all areas of the country have perfect weather year round, and this limits the times of year in which children can safely bounce outside. Extreme heat or cold make for dangerous outdoor play conditions, and having a trampoline that can also be used indoors makes the experience safe and comfortable for your little ones. You can use this in the yard as well as in the garage, or on a back porch. If you want to shield your little ones from the elements while helping them stay active, you’re going to love this trampoline. Indoor/outdoor design offers incredible versatility. 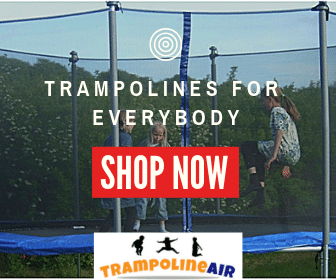 The legs of the trampoline provide maximum stability, while the plastic safety coating prevents indoor floors from being scuffed through rigorous use. Plastic coated components as well as a high, padded enclosure net make this perfect for little jumpers. They can tumble and bump without any significant risk of injury when using this trampoline. This design is best suited for kids 6 and younger. Older children won’t be able to make use of this gentle trampoline, as it’s not designed to support heavier jumpers, stunts or tricks. When it comes to indoor/outdoor trampolines, this is the best trampoline for the money. It solves a problem a lot of parents face, and offers a convenience you can’t deny. You’ll never have to take this down during the snowy season, as your children will still be able to use it indoors. Your kids can get a little exercise all year round. Indoor/outdoor trampolines for toddlers are hard to find, but they’re still easier to find than indoor/outdoor trampolines that will work for school aged children with an active interest in tumbling or gymnastics. 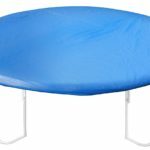 If you’re looking for a durable indoor/outdoor trampoline that your child can use to practice flips and tumbles, this one won’t let you down. It’s height makes it easy to use in a garage, and its 7 foot diameter is easy to make room for on both a lawn and a patio. This trampoline will hold up well for children with real athletic interests. If your school aged child takes dance or gymnastics lessons, this will provide them with a great way to practice at home. High enclosure net offers extended protection that your child will need to practice flips and trips from the center of the jump pad. 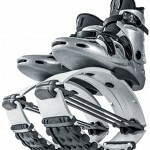 150 pound weight limit means that two children can jump together without putting too much stress on the springs. Though this is an indoor/outdoor sized trampoline, the feet aren’t padded to prevent floor scuffs. If you decide to use it inside, make sure you don’t use it on flooring that cannot be damaged. 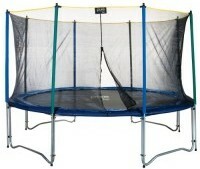 This trampoline fulfills a very specific need, and it may be in line with your child’s special interests. It’s easier than going to the practice gym to prepare for a cheerleading or gymnastics competition, and the convenience comes at an affordable price. 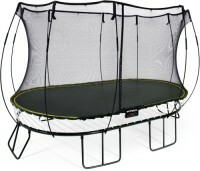 This is a premium quality trampoline at an affordable price point, and models like this are very hard to come by. Deluxe trampolines can cost a shocking amount of money from most brands, and Super Jumper has provided an excellent solution. 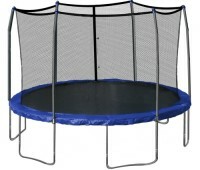 This 12 foot round trampoline is very spacious and supports a high weight limit. The included enclosure net is padded and thoroughly reinforced for maximum safety. One of the most competitively priced premium style trampolines on the market. 330 pound weight limit coupled with the large jump pad means several children of all ages will be able to jump. It’s unlikely your children will ever outgrow this trampoline. Impact resistant foam, UV coated components, and a galvanized frame means this trampoline can last for decades. A little more expensive than an average budget model, but the quality more than makes up for the price difference. It doesn’t get much better for this. If you love to shop for quality but also want to feel like you’re getting an excellent deal, this is the trampoline for you. Your children will be able to use it for years, and the investment will carry you into the future. If your child is just learning to jump, you probably don’t want to spend a fortune on a trampoline. You’ll be looking for a decent starter set that supports the development of athletic skills. This is exactly what the Bounce-N-Learn provides. The gapless enclosure with the extra padding comes in handy for little ones who aren’t so quick on their feet, and the colorful design allows children to easily spot and avoid the enclosure poles. 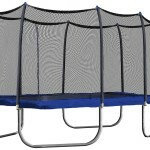 This trampoline will help your child build the foundation for lifelong athletic skills. By providing them with the tools they need to learn while they’re still young, you’re encouraging them to grow into healthier adults. The enclosure comes with a built in safety ring that children can use to hold for balance. As they’re learning to jump, they’ll be able to find their footing. Since this is a learner’s trampoline, it’s best to only allow one child at a time to use it for the sake of safety. The diameter is small, as it’s designed to only hold one jumper at a time. If safety is your primary concern and you’re looking to get your children active from a young age, nothing compares to the peace of mind you’ll get from a learner’s trampoline. Skywalker thought of everything when they constructed this design, and every tot will benefit from its numerous safety features.